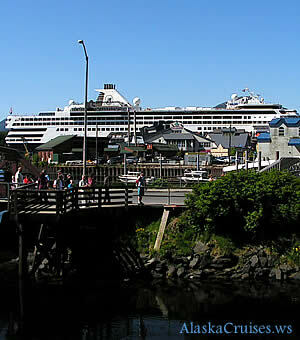 The southernmost port for the major cruise lines visiting Alaska, Ketchikan really is a port call for everyone to visit. Ketchikan is the fifth largest city in the state of Alaska but don't start thinking metro here. Ketchikan has a year round population of just over 8000 residents and barely qualifies as a town in many areas of the country. Still, in Alaska standards, Ketchikan is regarded as a city by its residents. Being smaller has it's advantages. You can walk to many of the cities local attractions although there is a pretty decent local bus system to aid in your shore adventures. From the moment you step ashore there will be no shortage of transportation options for you to utilize in your discovery of the "Gateway to Alaska". Ketchikan is also referred to as "Totem City" by many as the city has the largest collection of standing totem poles in the world. There are three main areas where you can see them in Ketchikan — Saxman Village, Totem Bright State Historical Park and the Totem Heritage Center Museum.